Last week, I saw something that sounded amazing. Like a dream come true. A dream called... TacoCopter. "Flying Robots Deliver Tacos To Your Location," said the website. It seemed to be too good to be true. It was almost certainly a hoax or prank. But it was also too irresistible not to get at least a bit excited about. So, I threw a link to it into last Friday's open thread. Shortly afterwards, I heard from aerial robotics researcher Paul Pounds, who informed me that while it would be very very cool to have a robot helicopter deliver tacos to me, it ain't going to happen anytime soon. 1. Currently available quadrotors have very limited flight time, typically less than 20 minutes. That means their maximum round-trip range is very short. 2. Typical quadrotors also have very limited payload - most often less than 500g. As they are increasingly loaded, their flight time and range decreases even further. 3. Flight control of robotic aircraft outdoors is still an open research area, and the technology to safely navigate urban environments like San Francisco does not exist in a form suitable for use on small platforms. 4. To my knowledge, the FAA has not yet accredited any operators for commercial use of unmanned aircraft systems, including taco delivery. So, while you could maybe fly a tiny taco across a room or maybe down the block, the dream of city-wide robotic taco-delivery isn't coming true anytime soon. Sounds like when TacoCopter founder Dustin Boyer says on Quora "There are a number of technical and legal hurdles that our team is working through," these are the sorts of hurtles to which he is referring. "I always see reports of ridiculous flying machines (e.g. the hotelicopter) pass without comment," Pounds wrote [Link mine]. 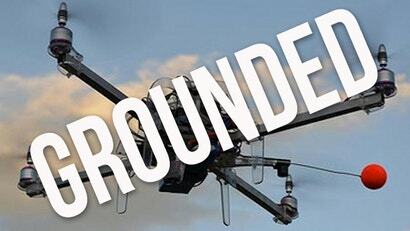 "It's worth pointing out that this kind of chicanery is a real problem for UAVs as a field. It's difficult enough to convince people that UAVs aren't all aerial spybots or killer drones. The last thing we need is people selling castles in the sky that lead to disappointment and cynicism about what flying robots are actually good for." "While one day we may enjoy aerial delivery of steaming hot west-coast cuisine, that day is not today." How about irradiating and then training Turtles to deliver pizza via the sewers? It's a sad moment when you realize that magic doesn't exist and that tacos can't be delivered by tiny helicopter robots. Still. If you're of the right age, and if the news is broken to you properly, you can take it as an opportunity to realize that while this specific magic doesn't exist... we can still enjoy the things about helicopter-robot-taco-delivery that bring us together: tacos. And robo-science. Just need infrastructure, Some sort of way of getting the payload to a docking bay of delivery copters, say one on each block or one to four blocks (I would suggest a subway pizza system, but that's just me) And then use the copters to deliver the sustenance the short distance directly to your backyard. Perhaps they should focus their efforts on burritos, then? I prefer them to tacos anyway. Although I'll settle for tacos if burritos are unavailable.